Art Review: “Exposure: Studio Show II,” new work from selected ceramists, printmakers and photographers in the Burlington City Arts Member Studios. Firehouse Gallery, Burlington. Through December 13. Exposure: Studio Show II,” now on view at Burlington’s Firehouse Gallery, offers strong collections of new works by 14 artists active in the Burlington City Arts photography, printmaking and ceramic studios — including the studio directors. It’s a juried showcase displaying both the high caliber and the aesthetic diversity of BCA’s studio programs. BCA’s clay studio and printmaking facilities are both located at the street level of Memorial Auditorium. George Breisch Gonzalez’s ceramics show the influence of the streets. His 18-inch-tall “Graffiti Vessel” appropriates tags and stylized bundles of lettering — similar to those found on walls and railroad cars — as decorative elements. His 14-inch “Traffic Platter” bears a crowded three-lane highway, seemingly rendered from a photograph, in the midst of a traffic jam. Allison Petroski’s ceramics are charged with a world beat. Petroski etches her black-and-white vessels with scraffito — scratching one layer of a surface to expose another. She is influenced by diversiform decorative motifs, including the rhythmic patterns of Mehndi body art and Indian subcontinental art and architecture. The lids of Petroski’s vessels and urns have exotic finials, and her platters are rich with intricate details. A welter of swirls, variously proportioned checkerboard patterns and beautifully painted lines become leaves, vines and animals. Mary Ellen Manock’s monotypes are abstract landscapes evoking Champlain Valley vistas, and they also suggest a loose Asian influence. Manock’s solid compositions are defined by simplified hues and fluid gradations of value. “Champlain Islands” is a diptych of two 12.5-by-22-inch vertical sections, with white negative space serving as the lake. Flat land masses recede toward the horizon beneath a powdery, cerulean blue sky. Manock’s 22-by-25-inch “High in the Green Mountains” has three ridge lines running horizontally, and discreet passages of red appear in the autumnal distance. BCA’s community darkroom occupies the lower level of the Firehouse. 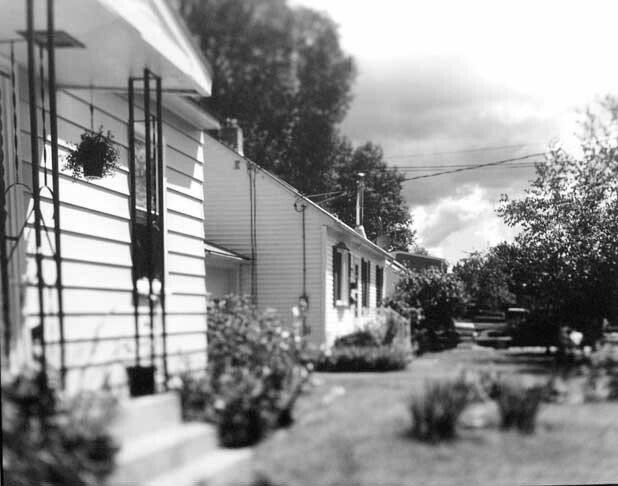 Director Mary Johnson contributed 16-by-20-inch black-and-white pieces to the studio show, including suburban scenes with blurred edges that give way to a sharp focal point commanding each composition. “Woodlawn” depicts a row of little ranch houses with modest lawns under a somewhat ominous sky. The title is more than a classic neighborhood name: Numerous prominent American cemeteries are called Woodlawn, including the largest one in New York City. That association probably wasn’t lost on Johnson. Allison Hale and Rebecca H. Babbitt also work in black and white, but their approaches are very different. Hale’s “Honda” is a 6-by-4-foot compound composition made up of 66 4-by-6-inch images of a Honda driving down an urban street at night. It’s not simply a cut-up photomural; the shots in the photo mosaic are all a little askew, taken from different distances. Hale composed the image with bands of gleaming streetlights and time-lapsed stars flowing in different directions along the top of the composition. Babbitt works with a Holga, and her 13-by-13.5-inch double-exposed scenes include the dreamy carnival vignette “String of Pandas.” The pandas are prizes offered to the winners of a dart game. Babbitt’s central figure has a distorted face, like the subject of a Francis Bacon painting, and the film’s double exposure creates complex, translucent layers. The BCA studio facilities have grown into an important and fairly affordable artistic asset for Burlington. In addition to community education programs, they offer equipment and resources on a communal basis that might not otherwise be available to local artists and artisans. The sampling of their wares on view at “Exposure: Studio Show II” demonstrates the zesty flavor of the city-sponsored slice of our creative economy.